Have a day or two in the city? Check out how Delhi has successfully reconstructed nature at one of its sprawling biodiversity parks. For those who prefer their nature well-behaved, there are some historical options: Deer Park and Lodhi Gardens, to name two. Abutting the newly hip Hauz Khas Village, Deer Park is named for its ungulate residents and is laced with walking trails, tennis nets, and a lot of trees. Lodhi Gardens, on the other hand, is more about lawns and Mogul architecture — a family-friendly picnic-and-cricket kind of place. But if you’re looking for something more, well, untamed, head to one (or both!) of the city’s ecologically progressive biodiversity parks. The Yamuna River begins its journey in the Himalayas, snaking through northern India, jogging by the Taj Mahal, and joining with the country’s most celebrated waterway, the Ganges, some 855 miles later. Largely healthy for most of its length, it loses quality once it closes in on Delhi. Agricultural and industrial runoff (hastened by deforestation and consequent erosion), conversion of floodplains, and biological invasions have all taken their toll on the once vibrant river. There was a time when Ganges River dolphins frolicked here, but they’ve been gone for years now. 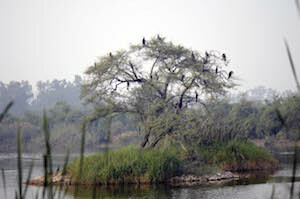 In 2002, plans began to convert some barren acreage north of central Delhi into native habitat. The former agricultural plot was desolate — nothing would grow there anymore. The woefully alkaline soil, with a pH of 9.2, was just too salty. 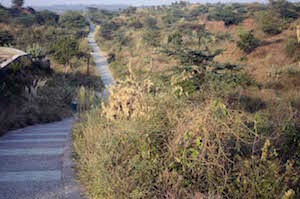 The Delhi Developmental Authority (DDA), partnering with the Center for Environmental Management of Degraded Ecosystems (CEMDE) and Delhi University, chose the site as one of the venues for its ambitious plan: to convert deteriorated and abandoned plots back into green spaces bustling with native flora and fauna. But given the level of degradation that had occurred, a fair amount of planning was in order. The first plan of attack was creating a wetland. Starting in 2002, the team at Yamuna sowed salt-tolerant plants to absorb excess salinity and make the soil hospitable once more. Some three years later, they added legumes and grasses to the mix. When the soil began teeming with microbial life, the game was on. More grasses were introduced, quickly followed by trees, including eight species of acacias. Insects arrived, and on their tails, the birds — waders and perchers, roosters and nesters. Migratory birds, some not seen for generations, made appearances. In 2009, the trees attained canopy and the park became a functional ecosystem. And then, a sure sign of success: many of the birds started breeding. 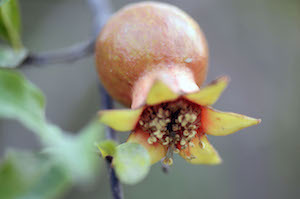 The number of avifaunal species grew from 27 (in 2002) to 192. Seventy-five kinds of butterflies, 18 mammalian species, and an astounding 800 types of plants round out the family. All of this was accomplished without the use of chemical pesticides or fertilizers. By all accounts, the restoration of Yamuna’s native semi-deciduous forest and grassland ecosystems is a rousing success — but the process was long and hard-fought. South of Delhi’s famous Mogul architectural sites, about 30 minutes down the Metro’s yellow line to Gurgaon, lies Aravali Biodiversity Park. Nestled in a crook of the Aravali mountain range from which it gets its name (also known as the Delhi Ridge), the park spreads an impressive 692 acres in the shadows of the 1,500-million-year-old range. Like Yamuna, Aravali Biodiversity Park is divided into two zones: the visitor zone and the nature reserve zone. Also like Yamuna, the biodiversity is impressive: this is the park that is so vast that it is home to jackals and nilgai (an elusive and very large specie of antelope). Predator and prey — an actual ecosystem at work. When entering Aravali, the visitor is greeted with an array of moist deciduous trees that will, upon maturation, attain a height of some 40 to 50 feet, becoming crucial habitat for both migratory and resident nesting birds. 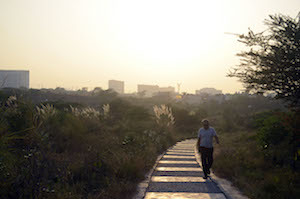 Walking further along the path, Gurgaon — Delhi’s post-apocalyptic version of a suburb, a collection of high-rises and malls drenched in color-robbing smog — simply disappears. The looming Metro vanishes as well. The prevailing sound is one of singing birds. Hues return. The tips of the grasslands glint gold in the setting sun; the butterflies, pressed by the dropping temperatures, settle in for the evening; the specimens at the Orchid Conservatory debut a new shade in the late afternoon light. This is Mother Nature’s canvas. Which is also a call to be wise. There is a rhythm of life here that doesn’t need the hustle and bustle of Delhi. This is the backdrop for the age-old saga of hunter and hunted. It is astonishing to think it occurs here — essentially alongside Delhi Metro’s yellow line — and it’s a testament to the success of the biodiversity parks. In fact, the nature here is so “real,” if you will, that team members at both Yamuna and Aravali are not allowed to stroll the grounds in open-toed shoes — both the king cobra and the Indian krait make their homes here. Welcome to a wild paradise, right inside Delhi. 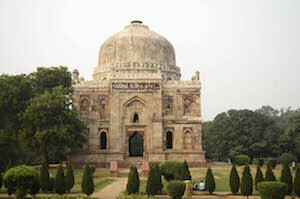 To reach Lodhi Gardens: Exit the Delhi Metro’s yellow line at Jor Bhagh. Ask any of the auto rickshaw drivers to take you, who will happily do so for about 50 rupees (80 cents). To reach Deer Park: Take the Metro’s yellow line to either Green Park or Hauz Khas, where auto rickshaw drivers are plentiful. Expect to pay around 50 rupees from the station to the park. To reach Aravali National Park: Disembark at Guru Dronicharya on the Metro’s yellow line. Get off on the side of the street where the traffic runs opposite to the way the Metro just brought you. You can hire either an auto or a bicycle rickshaw: by auto, it should take two to three minutes to reach the park; by bicycle, about ten. Be on the lookout for the ornate gates on your left. To reach Yamuna Biodiversity Park: Perhaps the most difficult park to reach. If you’re adventurous, take the Metro’s yellow line to GTB Nagar. From there, hop in a shared rickshaw to the highway. Once you cross the highway, hire a personal auto rickshaw. Be warned that the driver might not know the park, so keep asking people along the way. Alternatively, you can take a taxi from your hotel.